My dive buddy Sue recently purchased a used sit-on-top ocean kayak. She was exited to get out and try it. So we met one Sunday morning at Marine Room, La Jolla Shores . I had told her that I would let her set the pace and the distance we went each time. But I expected her to increase it a little each time we went. I had ulterior motives. I wanted to create a kayak monster just like I have become. I gave her some instructions and shoved her into the surf. She paddled out and made it through the surf without spilling. 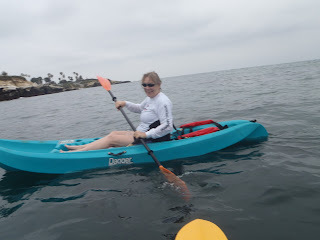 I then turned to the beach to get my kayak launched. When I turned back she was in the water. I paddle quickly out to her. I gave her verbal instructions on how to get back in. (I was not about to show her. I am not going to get totally soaked just so she can learn to get back on her kayak. She the one who tipped, not me). After a few tries she was up and ready to go. Then we set out. I said that pretty much everyone can make it over to " The Caves" Even the tourists who have never been on a kayak can do this. So we went there. Then I asked; "Can you make it to Buoy "A"?" She said she could. We did. Then I asked; "Can you get to Buoy "B"? She said she could and we did. Just about here I told her that out towards Children's Pool is where I have seen Gray Whales. Then she asked how far is it to "Children's Pool" I told her that it was about 20 minutes from where we were. She wanted to attempt it. I reminded her; "You understand that we have to get back, right?" She did and we went there. Just as we headed there we found ourselves in the midst of a small pod of Dolphin. That was a great sighting for her first time out. At that time I told her I was very impressed with what she had accomplished but thought we should turn around. We turned about and I explained to her the differences we would experience with speed and apparent speed now that we were going with the swell instead of against it. Soon we were back and ready to attempt re-entry through the surf. I gave her a few tips on how to avoid tipping in the surf. And she did it just right and stuck the landing 100% She was stoked about what she did. It was not until we were eating lunch and she went to lift her Iced Tea to drink that she realized how much had really done. She had to augment her lift with her other arm. Bu that was just a momentary thing. And she can't wait to get back out. But my plans have been foiled. I don't have to Create a Monster. It was there lurking beneath the surface all the time.